Both Donne’s parents were Catholics. His father was a warden of the Ironmongers Company in the City, and was one of those influential Catholics who managed somehow to avoid government attention. His mother was the youngest daughter of the poet and playwright John Heywood, and Heywood’s wife was the niece of Sir Thomas More. 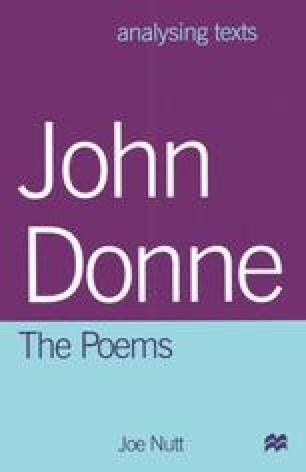 As a young, ambitious, well-connected young man, living with others of his kind in Lincoln’s Inn, fresh from university where his faith had meant he was forbidden to graduate, John Donne none the less had access to the very heart of Elizabethan culture and power. He travelled, although precisely when and where are subject to dispute, although we do know that he fought with the Earl of Essex and Sir Walter Raleigh against the Spanish at Cadiz, famously witnessing the destruction of the Spanish flagship, the San Felipe, and her crew in the burning seas. By the age of 25 he had all the gifts and experience necessary for a stunning diplomatic career, and this appears to have been what he wished for himself when he was appointed chief secretary to Lord Keeper of the Great Seal, Sir Thomas Egerton. It was a privileged position, one which gave him knowledge of the central political events of the time. Donne was established at Sir Thomas’s London home, York House, close to the Palace at Whitehall where he worked, and which was at the time the most influential social site in Europe. But the glittering career failed to materialise because, while living at York House, Donne fell in love with one of its occupants, Sir Thomas’s niece, Anne More, the daughter of Sir George More whose seat was Loseley Park near Guildford.